Time Tracker has been the solution of choice for many organizations since 1994, and is the easiest to use, off the shelf time reporting solution available. Time Tracker offers Web timesheets that are easy to use, that improve the time reporting and tracking process from start to finish, by simplifying reporting for users, automating approval routing, and simplifying the tracking and management processes. Time Tracker facilitates the tracking and measurement of time spent on projects and support issues across the organization, and its automated calculation of staff hours expedites payroll, invoicing and activity reporting. Time Tracker has multiple time reporting formats to accommodate different business functions, including research tax credits for R& D organizations, complete time reporting for IT Departments, Engineering, and Consulting Groups, capturing project, support, administrative, and vacation time. 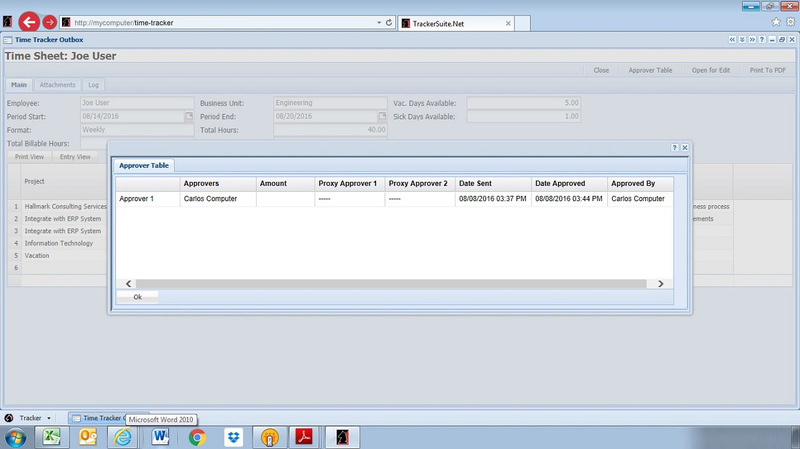 Time Tracker can also integrate with your current accounting, payroll, and HR systems. Using this software application, timesheets can be tracked and managed from any location by users via a browser or email client, through an intuitive "In" and "Out" box system. On creation, they automatically display leave and holidays. Using pick lists, users can charge time against projects, tasks and activities selected on an individual, group, department or organization wide basis, and they can even filter task selection to those tasks actually assigned to them. 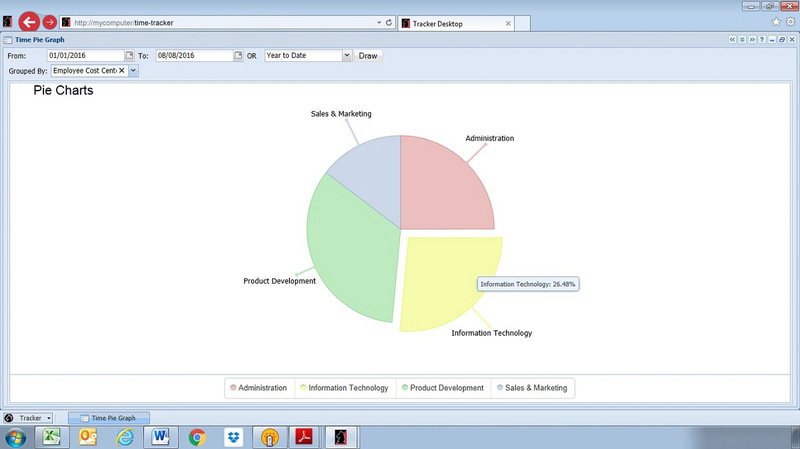 These forms also offer a WBS tree view for selecting tasks to charge time against. 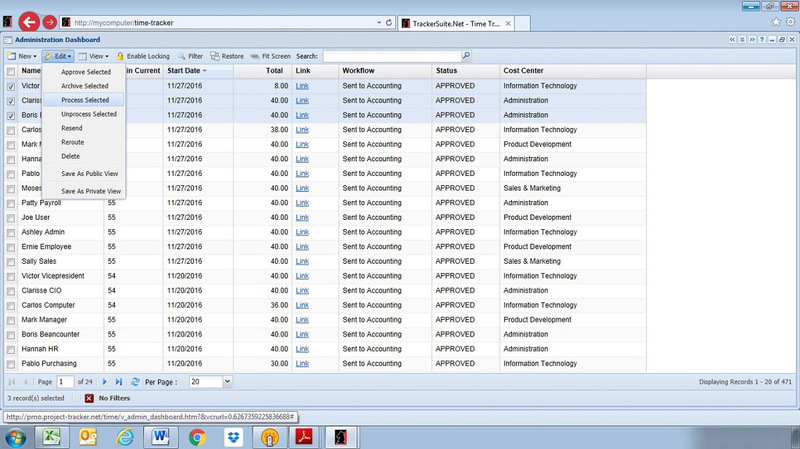 Timesheets provided through Time Tracker offer organizations a robust, comprehensive time reporting system. Time Tracker supports multiple formats for timesheets, including Daily, Weekly, Monthly and Semi-Monthly reporting. Time Tracker can also be configured to present an even simpler "Time In/Time Out" format, where the user simply enters the time they started working on a project or task, and when they finished. If you have 200 mobile users who neglect to enter just 2 hours a month on their timesheets, at a billable rate of $150 per hour, the resulting loss in revenue totals $720,000 a year! On top of that, consider all the potentially billable time your employees spend simply tracking and reporting their own hours. 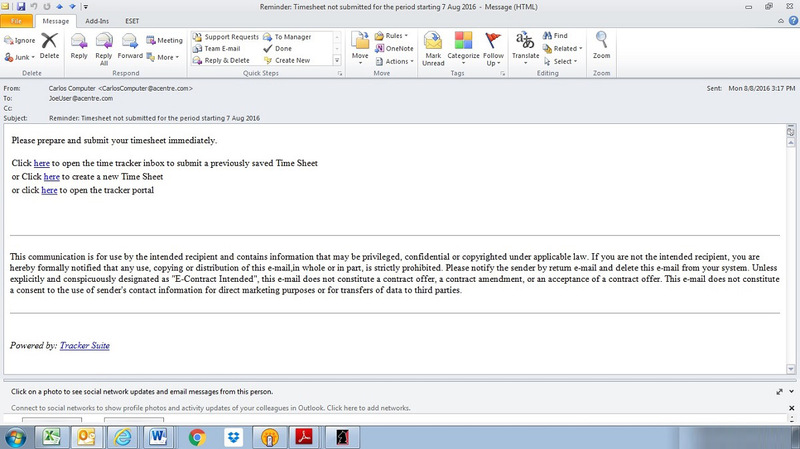 Submitted timesheets are automatically routed through the approval process for review and approval. All activity, from creation to final processing is recorded in an activity log, creating a trail of responsibility with electronic signatures. These two features ensure that all Web timesheets that reach Accounting have been properly reviewed and legitimately approved. We have spent a few decades perfecting the art of software design and development. Here are a few examples of Time Tracker at work. 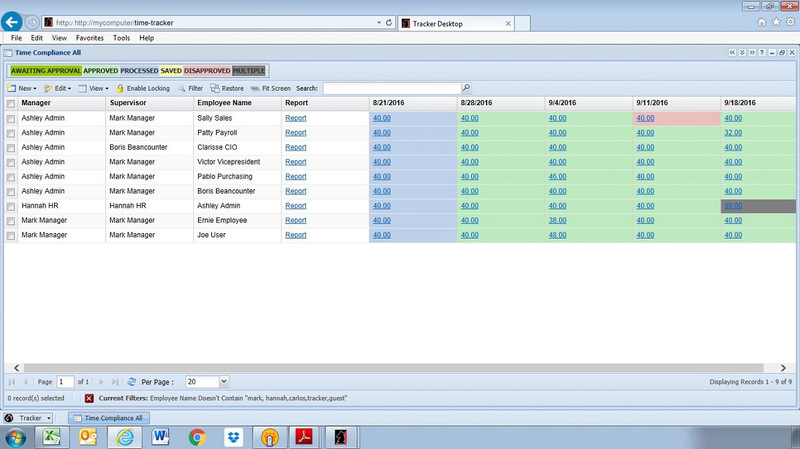 Managers can review color-coded compliance views for Web timesheets to monitor the status of timesheets in the system. 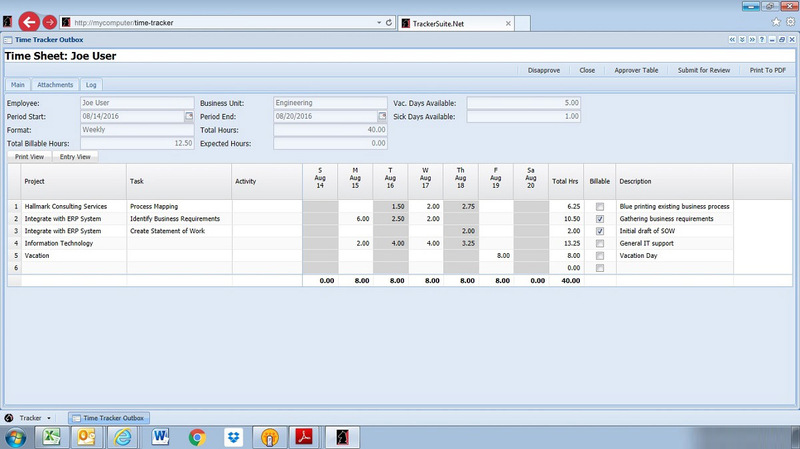 Administrators can also leverage timesheet dashboards for at-a-glance review and approval of multiple timesheets in the system. Users may report time from any location and any current browser via the Web or through Microsoft Outlook, Gmail, or Lotus Notes. Automated email reminders are sent for late timesheets, with links that put recipients one-click away from their responsibility. Timesheets utilize picklists tied to project and task data, which simplifies reporting as well as facilitating its accuracy and consistency in task time tracking. Submitted timesheets are smart-routed through the approval process. All activity in this employee timekeeping system is logged with electronic signatures, creating a trail of responsibility. Multiple timesheet formats, including Daily, Daily with time in/time out, Weekly, Weekly with time in/time out, Bi-Weekly, Monthly, and Semi-Monthly. Timesheet templates and validation profiles for each individual ensure that time is being filled out correctly, including rules for minimum/maximum hours and valid project codes. 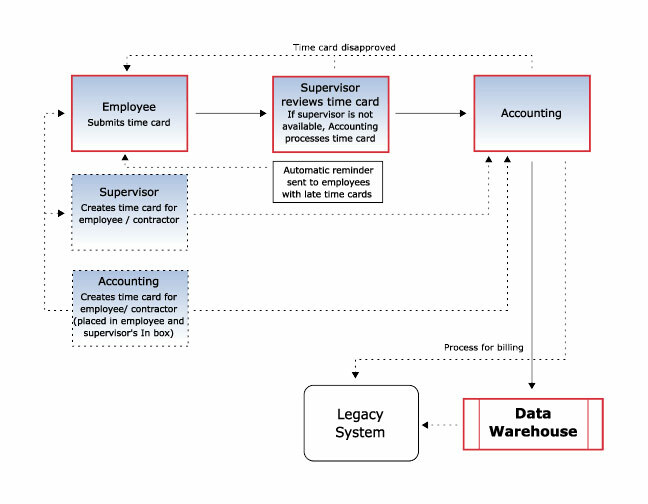 "Last Submitted Timesheet" function allows an employee to create a new timesheet based on the last one submitted in the timekeeping system. 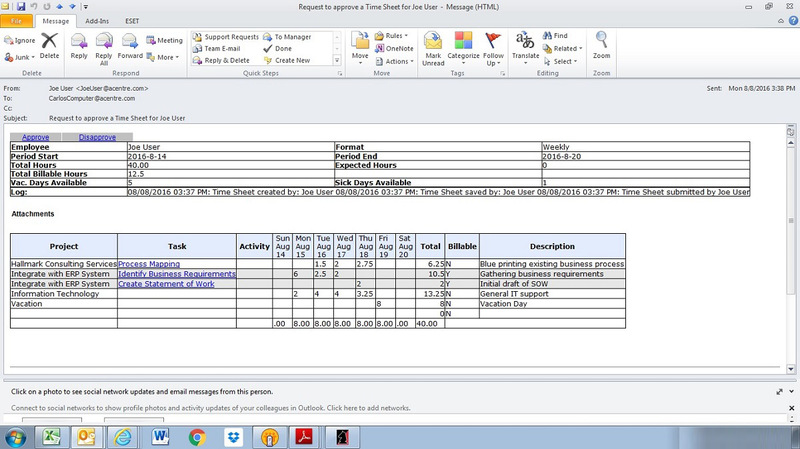 Our time reporting software integrates with common email systems including Microsoft Outlook, Lotus Notes and even Web email services such as Gmail, to simplify and automate time reporting with features including the ability to serve Web timesheets within email clients, as well as generate automatic email reminders for late timesheets. Time Tracker's timesheets can still be edited and updated after processing by administrators with an Open for Edit function that maintains snapshots of previous versions. Businesses looking for a complete time and expense system may consider a combined deployment of Time Tracker with Expense Tracker and Invoice Tracker. Time Tracker for contractors can also serve as part of a Paperless Accounts Payable system in tandem with Purchase Tracker, Expense Tracker and Payment Tracker.